Petitioner :- Ambrish Kumar And 4 Ors. Respondent :- State Of U.P. Thru Prin.Secy.Basic Civil Sectt.Lko.&Ors. 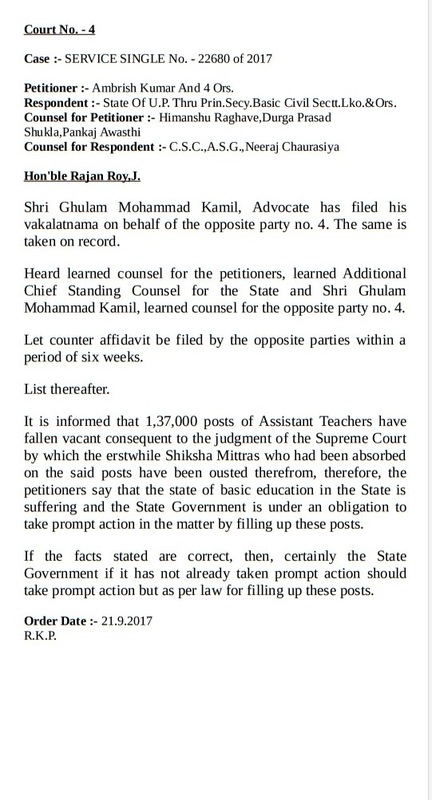 Shri Ghulam Mohammad Kamil, Advocate has filed his vakalatnama on behalf of the opposite party no. 4. The same is taken on record. Heard learned counsel for the petitioners, learned Additional Chief Standing Counsel for the State and Shri Ghulam Mohammad Kamil, learned counsel for the opposite party no. 4. Let counter affidavit be filed by the opposite parties within a period of six weeks. 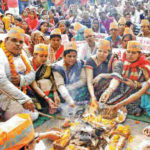 It is informed that 1,37,000 posts of Assistant Teachers have fallen vacant consequent to the judgment of the Supreme Court by which the erstwhile Shiksha Mittras who had been absorbed on the said posts have been ousted therefrom, therefore, the petitioners say that the state of basic education in the State is suffering and the State Government is under an obligation to take prompt action in the matter by filling up these posts. If the facts stated are correct, then, certainly the State Government if it has not already taken prompt action should take prompt action but as per law for filling up these posts.